Thanks to scribes Stan Gervas and Harry Atkinson, coupled with the folk-lore imparted by other contemporary Whitford employees who contributed to my incubation in the broadcasting industry, we have a fairly comprehensive picture, particularly, of Frank Poppa Whitford and his entry into the entertainment-business. We know that Frank and his brother Archer Whitford were entrepreneurial Kalgoorlie boys whose first venture was the short-term hiring of cushions to patrons at the Kalgoorlie outdoor picture-show. That connection with the entertainment industry developed into a business that manufactured the magic-lantern slides for cinema, sold advertising, and eventually led to the Whitford’s involvement in broadcasting. I started work as a control-room operator with the Whitford Network at the Radio 6PM studios in St. George’s House, 115 St Georges Terrace Perth in December 1963. I had been spending as much school-holiday time as possible there since 1957. By the time I had qualified as a licensed technician and left radio to branch into television towards the end of 1967, I had been subtly indoctrinated with the folklore of that establishment. It was Poppa who, at that time, well into his dotage, personally unlocked the door to my career in broadcasting when he told me; “Go out there, get your TV ticket and, when you’re ready, come back to us”. As it transpired, Mister Whitford sold 6PM to the Packer Empire before I was ready to come back but I will always be grateful to Poppa, Chief Engineer Arthur Taylor and their contemporaries for giving me the opportunity to learn, and to practise the craft that I lived for. When I started at 6PM, I became aware that the studios in the basement of Saint George’s House had already undergone several reincarnations. Station legend had it that the Traffic-office that had originally looked into the then record-library through a large, fixed window, had been part of the first Whitford’s Saint George’s House studios. The adjacent tea-room was also rumoured to have been part of that set-up and veterans recounted how the evening announcer was sometimes required to shuttle from one room to the other to provide continuity for separate programs running on 6PM and 6AM. By 1957, the station comprised two presentation suites and a concert studio arranged along the rear wall of the building and separated by a control room. All the rooms had long windows that enabled all occupants to see one another. A third presentation suite, out of sight of the control-room, served as a spare in case of breakdowns. It later became the News presentation studio. In 1963, 6PM-AM was still broadcasting community-singing every week-day afternoon at one o’clock with a live studio audience. We were still using a commercial magic-lantern to project the lyrics of the songs from the control-room onto a large screen at the far end of the concert-studio. Many of those magic-lantern slides, about one hundred millimetres square and made of two glass plates each about four millimetres thick sandwiching a sheet of cellulose were elaborately decorated. I think it was my Mentor John Stevenson who told me that the illustrated slides were a product of Whitford’s theatre-slide company and that there had been several graphics-artists employed by that operation in its heyday. Legend had it that they worked from premises in William Street, Perth, south of St. Georges Terrace and that the original Whitford’s Broadcasting operation had begun at that William Street site but nobody knew precisely where that was. Postal Records, contemporary newspapers and other information at Perth’s Battye Library allows us to form a more complete picture of the beginnings of the network. Whitfords first gained the licence to operate what was then called a B-Class Station at Northam in Western Australia. 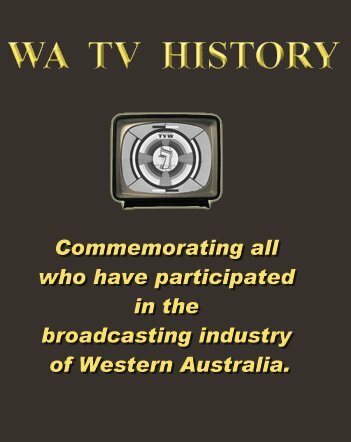 At that time, the new Whitford Company, Northam Broadcasters Limited had the registered address, 23 William Street Perth. 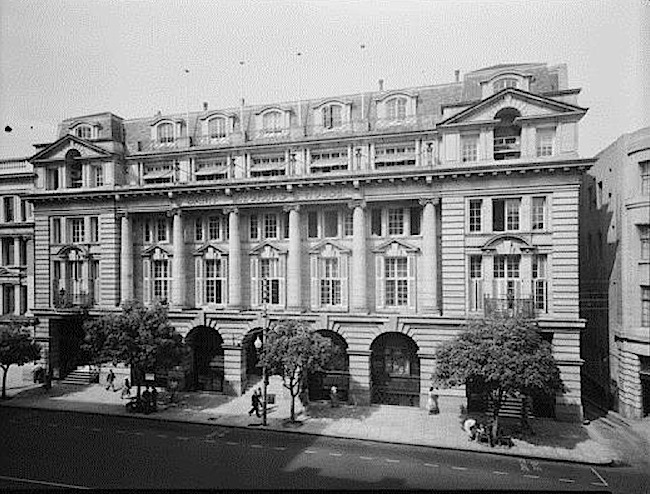 The Postal records of the time identify that as this building, Prince’s Chambers on the western side of William Street just south of the corner of St Georges Terrace. 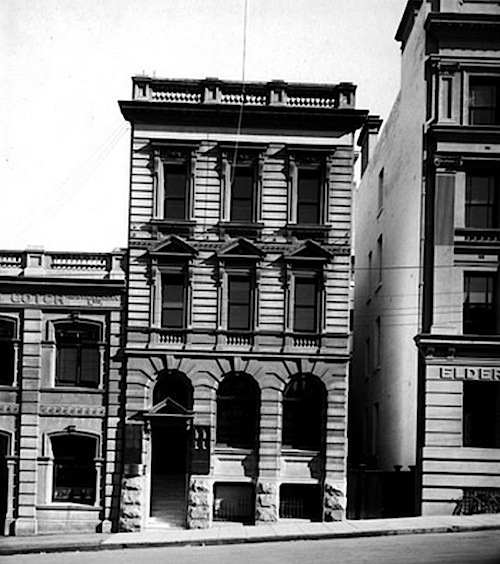 The Elder’s building immediately to its north, stood on the south western corner of William Street and St Georges Terrace. Metropolitan Land and Investment Company Limited, agents and accountants. Whitford and Company F. Estate Agents. Pages 4 and 5 of The West Australian newspaper on Thursday 31st of May 1934 contain a feature pointing to the imminent opening of 6AM the following day. From that feature, we learn that 6AM operated from studios at Prince’s Chambers and fed its program by “special land-lines” to the transmitter at Reservoir Hill, four miles from the Northam Post Office, (its location to this day) and about a hundred kilometres from Perth. A five hundred Watt (“powerful”) transmitter fed a long-wire antenna suspended between free-standing towers. 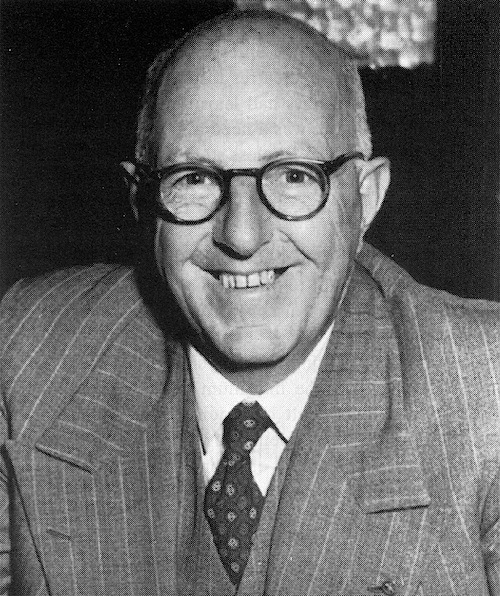 The founding engineer for 6AM was Wally Coxon who, by then was well established as the most experienced wireless-engineer in Western Australia. Postal records also tell us that later, as a consultant, Wally Coxon had his office at the AMP building a little further up William Street on the north western corner of St Georges Terrace. The 6AM feature in The West Australian also provides us with some interesting information about staff and facilities. Ned Taylor, a well known funny-man and former 6ML personality became the Breezy-Bird breakfast announcer and Joan Good, shown here “at the announcers’ table” was recruited as the Women’s Session hostess for 6AM’s afternoon offerings. The below picture shows Wally Coxon officially handing over the 6AM transmitting station to Frank Whitford. The press reported that 6AM was heard loud and clear throughout the Avon Valley and well down into the Great Southern districts during its pre- opening testing. Legend within the network in the sixties held that the call-sign 6AM was chosen because the station was able to be heard in major markets in the mornings. Indeed, it was said that the transmitting antenna was designed and had been oriented to provide a very serviceable signal into the Perth metropolitan area where it was able to compete with WA Broadcaster’s 6IX and Musgroves Limited’s 6ML, and 6PR which was operated by the other prominent Perth music store Nicholsons Limited. Others held that the AM in 6AM was chosen because it represented the last two letters of Northam, the major centre in the station’s immediate service area. 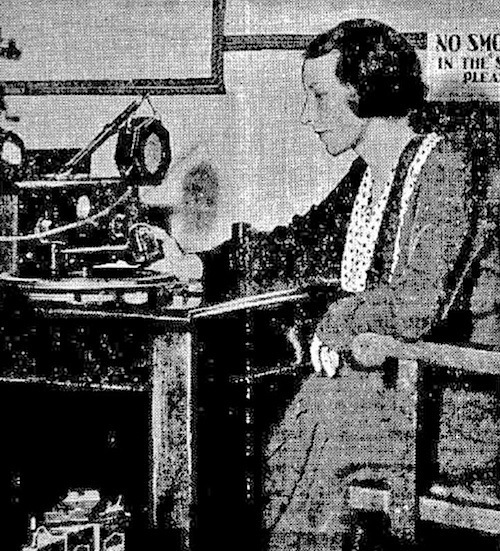 In fact, prior to the commencement of government-regulated broadcasting, a number of amateur radio operators had been conducting entertainment programs over the air in various parts of Australia. The amateurs were so prolific in some areas that arrangements had to be made for them to time-share the broadcasting channels. One such amateur was a Mister W. H. Willis who operated a station with the call-sign 6AM from Fremantle. It seems that Mister Willis, following in the footsteps of enthusiasts in the United States probably included the letters AM in his call-sign to signify that his transmitter used Amplitude Modulation. I can quite imagine the use of such terminology being part of walking the walk and talking the talk among the early wireless enthusiasts. Somehow, Northam Broadcasters Limited came to an arrangement in which Mister Willis “generously handed over his call-sign” hoping that 6AM Northam would be “as great in its commercial sphere as the AM station in America, which (was) recognised as the greatest amateur station in the world”. By 1936, Whitfords had gained a licence for a metropolitan B-class station. B-class stations were so designated because they relied on commercial advertising and subscriptions for their revenue. The so called A-Class stations were responsible for carrying the national radio services and were funded by listener-licence fees. 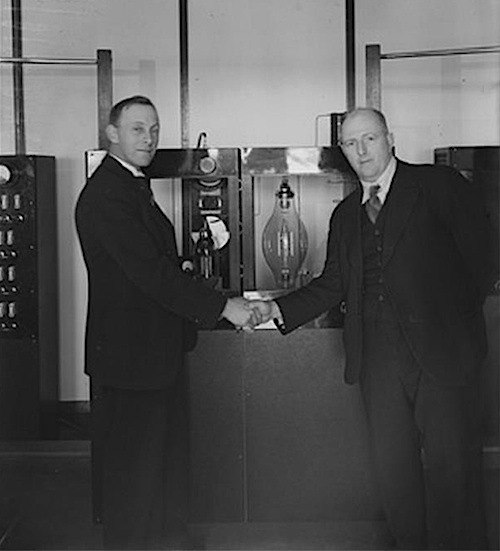 Whitford’s Chief Engineer Fred Tredrea was sent to Sydney to investigate the purchase of “high fidelity” equipment for the new station that was ostensibly to serve Fremantle and areas to its south. Radio 6PM opened on the twenty second of April 1937. 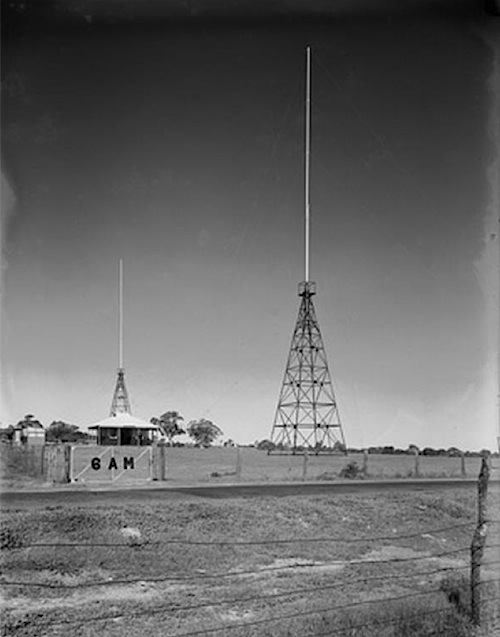 Its 100 Watt transmitter was located on high ground at the corner of Marmion Street and McKimmie Road in what is now the Perth suburb of Palmyra. Apparently coincidentally, Northam Broadcasters Limited moved its studio operation to Saint George’s House. Although there was mention in the press of a 6PM studio at Fremantle, it is clear that the majority of Whitford’s programming for 6PM and 6AM originated from 115 St Georges Terrace. The press at the time reported that the new station, 6PM could be heard as far south as Albany. By 1938, 6KG Kalgoorlie, which had been operated by Goldfields Broadcasters Limited since 1933, had moved its transmitters to Parkeston, about three kilometres east of Kalgoorlie and increased its power to 500 Watts. It had been the advent of 6KG that had inspired the Whitford brothers and brought about their realization that there was money to be made by selling advertising space on the wireless. In 1938, Frank Whitford returned to Kalgoorlie to buy 6KG. 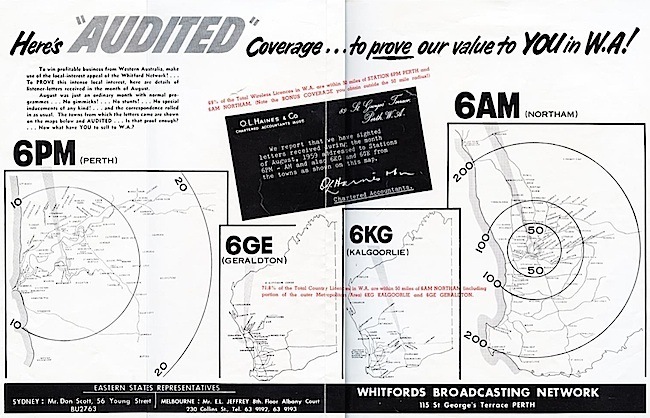 Late in 1940, Whitfords extended their radio network further by assuming control of the struggling 6GE Geraldton, owned by Great Northern Broadcasters. In November 1940, 6PM’s transmission facility was relocated to Coffee Point at Applecross and its power was increased to 500 Watts. A press advertisement in The Sunday Times on the tenth of November 1940 invites listeners to tune in on Friday nights for a quiz show called The Relax (soap) Kuckoo Kourt. 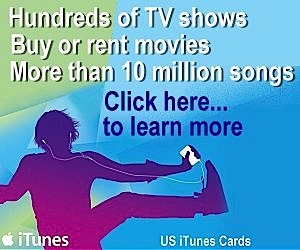 That advertisement concludes: “Have you heard the new 6PM? You must have noticed the difference in the clarity of reception and tone during the last fortnight. The new transmitter at Coffee Point is a grand step forward”. During my tenure at 6PM and at the transmitting station at Northam, 6AM relayed 6PM’s programs via landline from Perth for the majority of the broadcasting day. From nine until nine thirty in the morning, from noon until one, and in the evenings between six thirty and seven, special sessions exclusively for Northam Traders and Agencies emanated from the second studio at St Georges Terrace. No doubt special advertising rates were offered during these Northam-splits to maximise the network’s revenue. The cost of relaying program to Kalgoorlie and Geraldton by landline did not fit the business plans for 6KG and 6GE as efficiently as self-contained, local operations. 6KG and 6GE were operated as separate entities and provided a training ground for most of the 6PM/AM announcers but the stations remained part of the Whitford Network, able to be linked together for special events, and they were effectively administered from Saint George’s House. The Whitford Network as I knew it was eventually dissolved when Poppa sold 6PM, 6AM, 6KG and 6GE to Frank Packer’s Consolidated Broadcasting System in July 1969. Gus Slater is a former Director of Engineering and Technical Operations for Channel 9 in Perth and former Chairman of Directors of Perth Translator Facility Pty Ltd (a joint venture company owned by TVW7, NEW10 and STW9). Gus is a consultant to the broadcasting industry, specialising in sound. The Australian broadcasting industry presented Gus with The Paul Marlan Award for his chairmanship of the industry study group investigating audio-loudness in 2006. My dad Len Baker worked for Whitfords Theatre Ads prior to the takeover by Val Morgan. I have meny happy memories of being taken into the Sussex St Sydney offices and seeing the manufacture of glass slides. If you have any remnants of this era available I would love to see them. My father Ron Morris also worked for David Whitford in Sussex St 1950’s/60’s. I remember being with Dad in David’s Mercedes about 1960, it had a phone, no idea how it worked. I remember going to the Civic Hoyts Theatre at Hurstville about 60/61 to see Dads car on the screen advertising C.V. Holland’s car sales. The old man would have made sure he was paid for the use of his car. In the 1980’s and 90’s I broadcast a weekly news bulletin to the Wireless Institute of Australia radio amateur members on various short wave frequencies. Harry Atkinson was retired by then and being substantially blind and a Ham himself he contributed tape segments about items of interest to the members. As the consummate professional broadcaster he was short and to the point finishing with one of his dry and humorous closing lines. I would love to hear from anyone who knew Harry, drop me a note to PO Box 267 Balingup, WA 6253 with your phone number and we can have a chat.